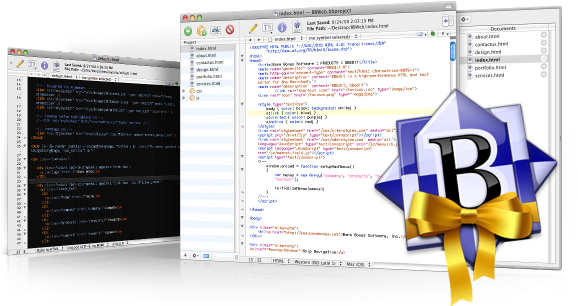 BBEdit for Mac is the leading professional HTML and text editor for Mac OS X. ...... navigation and syntax coloring for numerous source code languages, code folding, FTP and SFTP open and save, AppleScript, Mac OS X Unix scripting support, text and code completion, and of course a complete set of robust HTML tools. What's new in BBEdit 9 for Mac? * Projects - A Project is a vastly improved modern expression of BBEdit's 'File Groupa' feature. Project windows include an editing view: Click on a file in the Project list, and it immediately appears in the editing window. Projects may contain documents, folders, and Collections - custom groupings of documents that can be anywhere on any local or remote computer. Qweas is providing links to BBEdit for Mac 9.6.2 as a courtesy, and makes no representations regarding BBEdit for Mac or any other applications or any information related thereto. Any questions, complaints or claims regarding this application BBEdit for Mac 9.6.2 must be directed to the appropriate software vendor. You may click the publisher link of BBEdit for Mac on the top of this page to get more details about the vendor.